Michael Timko couldn’t believe it at first. Then a huge smile spread across the face of the varsity football player for Cardinal Ritter Jr./Sr. High School in Indianapolis. Looking into the offensive backfield, Michael focused on the unlikely uniform of the person who was lined up at the running back position for the practice drill. The running back wore black running shoes, black pants, a black shirt and the white collar of a priest. Father John Hollowell also had his black baseball cap turned backwards—“for aerodynamics,” he said later. Fifty yards later, the former varsity football player at Roncalli High School in Indianapolis and Hanover College near Madison finally came to a stop. With the defensive players in their red jerseys still watching him and shaking their heads in amused wonder, Father Hollowell spiked the ball. Father Hollowell enjoyed the moment, too—even if it left him nearly breathless. Discipline, passion, challenge and joy—all four words describe the priesthood of Father Hollowell, who was ordained on June 6. There’s also an element of “surprise,” at least in the way he has used his priesthood to connect with people in the hope of bringing them closer to God. Consider the first meeting that Father Hollowell had with Ty Hunt, the head coach of the Ritter Raiders’ varsity football team. Hunt thought that Father Hollowell would be the chaplain for the team, a priest who would pray with them and celebrate Mass for them before every game. When Father Hollowell told Hunt that he also wanted to coach, the head coach had questions and doubts. Hunt laughs when he talks about how that approach surfaces on a football field. Father Hollowell’s passionate approach also leaves even deeper impressions. “What he does transcends football,” Hunt says. “More members of our football team have stood up as altar servers this year and have been willing to help others. It’s the kind of praise that Father Hollowell immediately downplays. After all, he’s always been a team player first, starting on a Catholic Youth Organization football team at his home parish—Nativity of Our Lord Jesus Christ Parish in Indianapolis. Then at Roncalli, where he graduated in 1997. Then at Hanover College, where he graduated in 2001. Yet while he is the ultimate team player, he also knows that every player on a team has a distinct role. 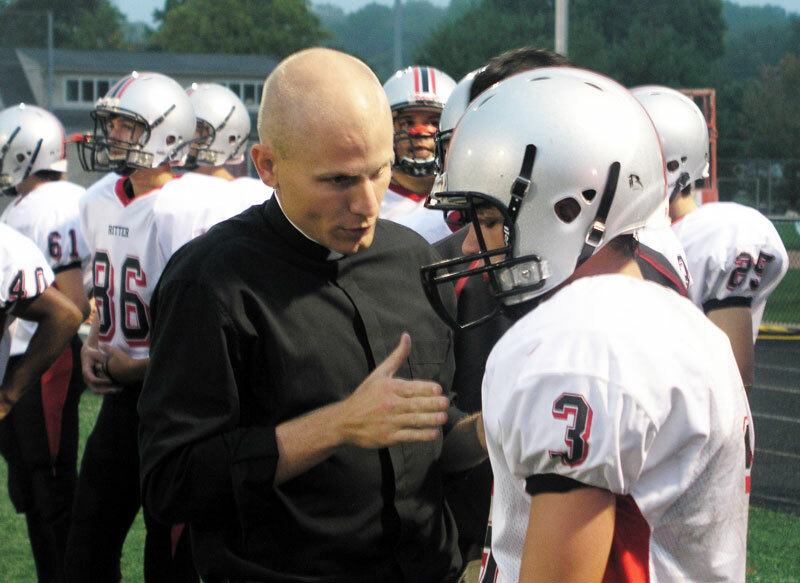 And because he views his life as a priest as part of a greater brotherhood of Christ, he embraces his role of bringing young people closer to God as a teacher, coach and chaplain. On football game Fridays, Father Hollowell not only teaches students in the classroom and coaches them on the field, he also celebrates a pre-game Mass with the team. At 16, Cardinal Ritter sophomore Matt Swintz recalls one of Father Hollowell’s homilies that left its greatest impression on the football team. One of Father Hollowell’s favorite times on a football field has always been that moment just before the game begins—when all the hard work and preparation of a week of practice leads to the anticipation and excitement of the opening kickoff. As a player, he couldn’t wait to get on the field to do everything he could to help his team win. As a coach, he is just as intense, but his perspective has also widened. He also hopes that when the young athletes look at his life, they will look beyond his intensity for football and see his passion for his faith—and the priesthood. 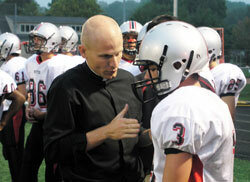 So Father Hollowell keeps teaching, coaching and serving as a chaplain. He gives everything he has while knowing he has been given the greatest blessing of his life.